As part of the 2015 Lyttelton Port Recovery Plan / Te Mahere Whakarauora i Te Pūaha o Ōhinehou, the Lyttelton Port Company (LPC) consulted Te Hapū o Ngāti Wheke Runanga, and was gifted the name Te Ana. The tauihu sculpture created by Whakaraupo Carving overlooks the terrace of milled reclaimed wharf piles and out toward Lyttelton Harbour. This new name for the former Dampier Bay reflects the significance of Te Ana o Huikai, a cultural site closely associated with the bay in which the marina sits, and traditionally recognised as a safe anchorage, with bountiful fish and shell fisheries. Urban designers, landscape architects and cultural advisors from Boffa Miskell’s Christchurch office prepared an urban design framework and cultural landscape assessment for the site as part of the Lyttelton Port Recovery Plan. Key goals were to recognise Ngāi Tahu values and aspirations; and for increased community access to the Dampier Bay waterfront. The 2016 Design Guidelines, and the subsequent development of Te Ana Marina reflect this. The rustic timber seats overlook the newly constructed Te Ana marina development. To create a strong visual connection to the water, the design team used terracing, stepped down from the main promenade toward the water. A new seawall of boulders also brings people closer to the water. The promenade with paving motifs drawn from the cultural narrative spans the length of the site. It draws on patterning significant to local iwi in regard to mahinga kai species available. The chevron pattern represents the reef shark and is drawn from the wharenui Wheke at Rapaki Marae. The chevrons are reminiscent of waves, which dissipate as they move inland and become gravel paths within small parks, where areas of indigenous coastal planting acknowledge the original coastline. A public gathering and nature play area represents a landing beach and coastal edge near where the historic coastal edge used to be. Recycled wharf timbers have been used as seats and bollards, and the seats have been fitted with bespoke sleek white metal seats with backs and arms. Contemporary design elements such as metal LED lighting designs and fixings reflect the port’s industrial character and echo the look of nautical fittings. Cultural design elements by Whakaraupo Carving Centre tell stories of people and place, and their materials, colour palettes and scale merge seamlessly with the wider aesthetic and the surrounding landscape. The site has been planted using indigenous coastal species, with the exception of a number of pōhutukawa trees which were requested through mana whenua consultation and take pride of place on the promenade frontage. 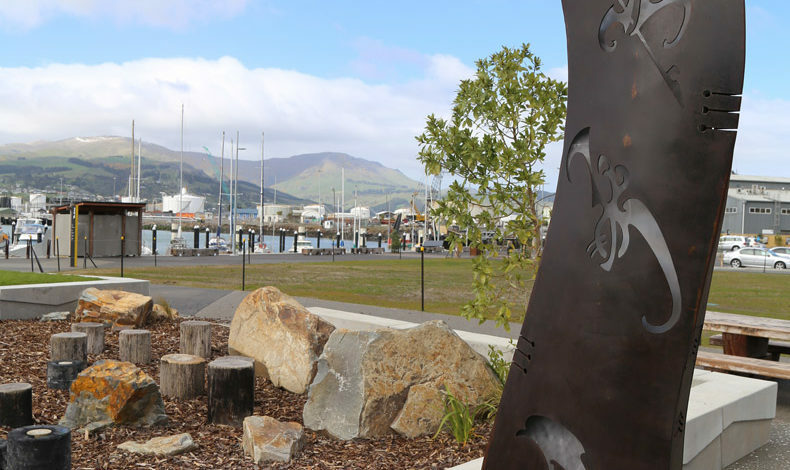 The next stages of development include public realm enhancements and direct connections between the town of Lyttelton and Te Ana Marina.